The best two stage snow blower is the ideal way to get out of the tedious and slow job of having to shovel snow. It’s also quite dangerous. Every year many people get injured or die because of shoveling snow because it’s such strenuous work on the heart. There’s also the risk of frostbite or hypothermia for being out in the cold for a long time. Dual stage snow blowers are more powerful and better for deeper snows than single stage or snow shovels. In fact, if you’re expecting to get frequent deep snows then a dual stage snow blower is worth the investment even if you’ve already got a single stage. These can handle deep and thick snows and are built much tougher than the smaller, lighter single stage versions. Unlike a single stage a dual stage has two different processes that snow goes through before it comes out the chute. In a single stage the auger minces the snow up before forcing it into up and out of a chute. In a dual stage snow blower, the snow passes through a fan which minces the snow even further so that it can be shot out at a faster rate. These augers may be metal or plastic and are often rubberized to protect the blades from being damaged when in contact with the ground. As you push the machine forward the blades chop into the snow, breaking it up. Since dual stage machines are more powerful they’re also ideal for ice. Unlike a single stage the dual stage blowers are more durable and more powerful. You will need a dual stage machine if you are dealing with a large area or with a snow that is greater than 10” in depth. While it’s possible to find some single stages which can go this high they may get clogged. 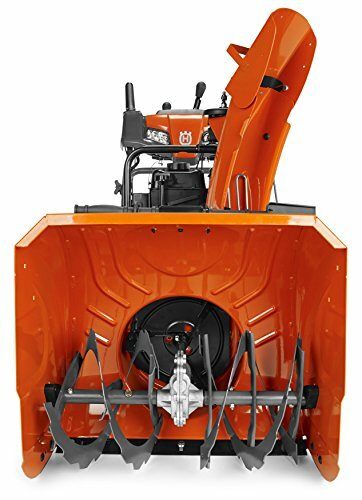 A dual stage snowblower isn’t suitable for very wet snow because the weight means it will disintegrate into the water with the fan and may end up refreezing on the area as ice. As these machines are more powerful a dual stage machine is also better for slopes or uneven terrain. To use a snowblower, you want to push it just like a mower on the grass. Wear sturdy, waterproof, slip-proof footwear and ear protection because of the noise. You may also want to wear eye protection in case of flying rocks. Start the blower and then push it forwards with steady, even steps. If the chute becomes clogged shut it off and wait for all parts to stop moving before using a cleaning tool (never your hand) to move the stuck snow. The main difference between the two as mentioned above is the fan. Since dual stage machines are meant for deeper snows they’re usually built tougher and will have power wheels or power assistance to help push it. These machines are always larger and heavier and have a much bigger frame so this is essential. 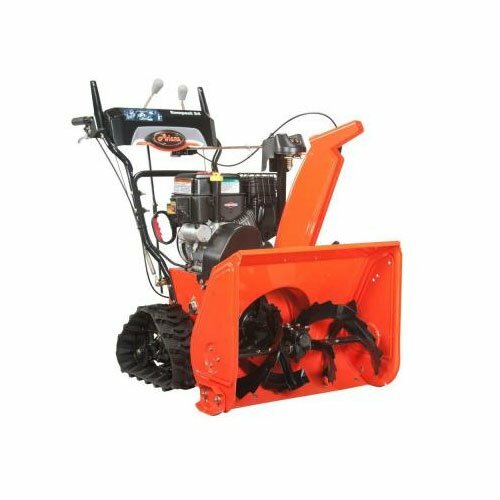 The auger in a dual stage machine does not touch the ground so it can be driven over gravel and grass without damaging the surface but it will leave a layer or snow or ice behind meaning you may have to make several passes or use another method to get to the ground itself. These have much bigger engines and more power because they have to push two things. The best two stage snow slower is are usually the most expensive type with the exception for professional machines. These are always gasoline powered no matter what type you get but they may have some sort of electrical assistance. Best Features Of A Dual Snow Blower. When buying a snow blower the first thing you need to know is how big of an area you are working with. A dual stage blower is intended for larger areas or those where you don’t want the blade to contact the surface. Since these are bigger machines they should have upgraded and larger wheels with deep tread to tackle the deeper snow. The engine needs to be a 4 cycle design or it may not have much power for really deep snow. Ideally, the chute will have some form of adjustment (either manual or auto) and it’s also convenient if this is on the handle but not essential. Some larger machines also offer gears and transmissions which is ideal if you’re working with uneven terrain or slopes. Look for reinforced steel blades or serrated blades as these are more durable than plastic and less likely to be damaged by rocks if they get picked up. Most larger machines don’t come with an electric start but if you can get a machine that has both an electric start and a push start it will make your life easier, especially if the weather is very cold. 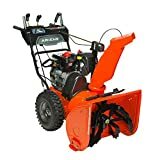 The cost will also be a factor if you’re not sure whether you really need a dual stage snowblower since many of the larger single stage machines are comparable in both power and capacity. The two most important things to look at are the throw distance and the capacity – this will determine how far away the snow goes when processed and how much snow the machine can handle. How To Choose A Snow Blower. When choosing the best two stage snow blower you need to know how big the area is that you’re working on. A small area or driveway does not need a Pro level blower while trying to blow a large driveway or deck space is going to be miserably slow and difficult with an entry-level machine. This will also apply to how big of a motor you need. A fairly expensive model but it’s got some impressive additions to make it worthwhile. Instead of wheels this has tracks so it will never get stuck and will easily pass over any terrain. These also prevent the machine slipping even on steep inclines and on slick pathways. The design has 3 separate blades which are freeze resistant and a 12” impeller for added power. The gear case is cast iron and the rest is stainless steel for durability. It has a wide 24” path and a solid 5.5” axle. The ignition is electronic and is a push button design for speed but there’s also a pull start as well. It has a remote chute control on the handle and it can turn 205 degrees. It has a 208cc engine with 9.5ft/lb of torque. It is built very solidly and heavy. It does have two reverse gears as well as a headlight, though you may want to replace the bulb with something brighter as the factory is quite dim. It has a throw distance of between 3-40 feet and a disc-o-matic drive system for hills and slopes. The handles can be locked for one handed use so that you can adjust with one hand while powering/steering with the other. It doesn’t work well on wet snow and as far as motors go, this isn’t any more powerful and may even be less powerful, than higher grade single stage machines yet is three times the price. The tracks do make it less slippery but much harder to turn and maneuver since there’s no power assistance. Not suitable for wet snow. 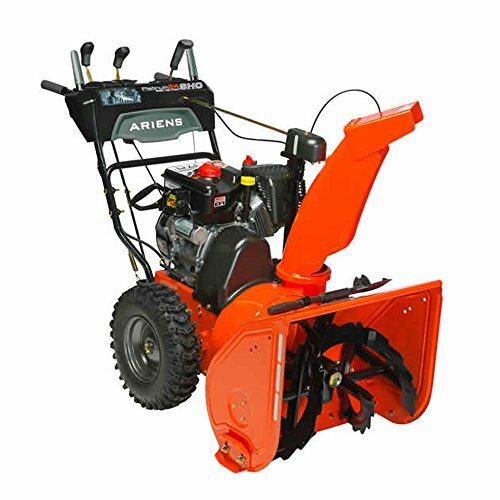 With a larger engine and a significantly bigger path than the Ariens this is also several hundred dollars cheaper. It has a whopping 30” path with a 291cc engine that can easily handle 12” of snow. It has both an electric start and pulls start with power steering and big 16” tires to get over any terrain. The wheels mean that it’s much easier to turn than tracks but the rubber still slips a little on the slick terrain in comparison. The chute can be rotated remotely up to 180 degrees and has a deflector to make sure nothing flies backward. It’s extremely heavy at 270lb and difficult to push and move on your own until it’s running. The grip handles are heated for comfort. 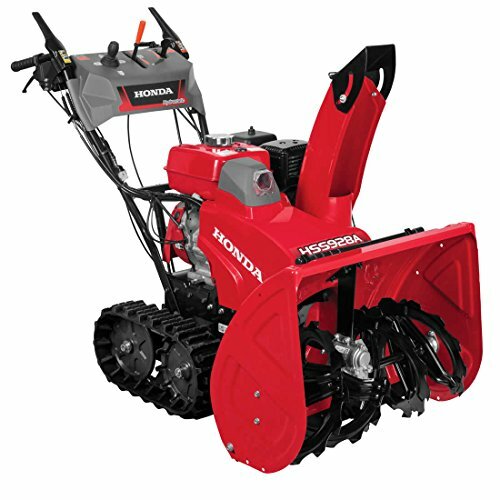 It has an aluminum gearbox, friction disk transmission, and 12” ribbon augers to make quick work of any snow. It has one reverse gear and 6 speeds. The back of the auger has a scraper blade to get it practically to the bare pavement so this isn’t ideal for grass or for gravel areas as it will pick up stones. It can be quite hard to get replacement parts for this model and many dealers don’t warranty it if you buy online. Adjustable Handle with heated grips. Not suitable for gravel or grass. Aluminum, not cast iron casing. 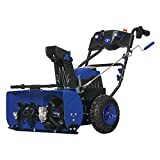 An electric dual stage snow blower, this is unique in that it’s extremely quiet and with the larger battery it can run up to 40-50 minutes on a single charge. The design uses two batteries with an integrated LED display and comes with the charger. It’s cordless and has a capacity that can rival most gas-powered blowers, if not match their run time. The steel augers are made of serrated steel and are 13” wide with a 24” path. It has a capacity of 1000lb/minute which is less than the gas-powered versions but still comparable or better than most single stage machines. It has a throwing distance of up to 32 feet and a scraper bar to get right to the surface. The chute is adjustable 180 degrees and it can handle up to 12” of snow. The electric motor is brushless and has very little vibration. It’s self-propelled with 3 speeds and one reverse gear. There are also two headlights and knobbled rubber tires for better traction. Being electric means this is a much more Eco-friendly option and it’s better if you don’t want to annoy your neighbors with a loud noise and don’t want to hurt your hands with extreme vibrations. This isn’t good for wet snow and will clog quickly even if it’s not very deep if the snow gets too wet. Being electric also means that this is a very light machine which weighs just over 100lb so it is much easier to maneuver than the extremely heavy Husqvarna. At almost double the price of any other, you are definitely paying for the brand here. While the motor is a decent 270cc, there are similarly priced models offering almost double that power in the pro category. This is a commercial grade machine that will start even in the coldest temperatures. It has pull and electric key start which is convenient because it doesn’t require you to plug it in like some electric start machines. The tracks on it are hydrostatic so that it can move smoothly without slipping on slick or sloped surfaces and the speed control allows you to move at your own pace. The levers are very conveniently placed and sensitive enough to be adjusted with a fingertip. It has an adjustable auger height and a pneumatic strut for easy adjustment. The chute has 4 direction control. It can tackle snows up to 21” in height and has a 28” path. The engine is average size. Another top grade machine, this is ideal for gravel and grass. It has a similar intake height (21”) to the HSS928ATD but only a 24” path. It’s rather pricey thanks to the Electronic Fuel Injection engine system, though this gives it a much quieter running than any other fuel engine. It’s also much more efficient and doesn’t need weatherizing when it’s sitting in the summer.This also has an electric key start and a recoil option (though you have to buy the cord separately). It’s winterized for extreme cold and has a high output impeller. There are 6 forward gears and two reverse speeds as well as an automatic turn adjuster which senses when the machine is turning and adjusts the inside wheel power. The chute can rotate up to 200 degrees as well as up and down. The handles can be locked and the chute operated remotely for convenience. It has a maximum throw distance of 55ft and a huge 369cc engine but that’s necessary to push this hefty beast that weighs almost 300lb. As this is a pretty new machine it’s quite difficult to get parts, and the EFI technology is such that many dealers won’t work on them if there’s a problem either. 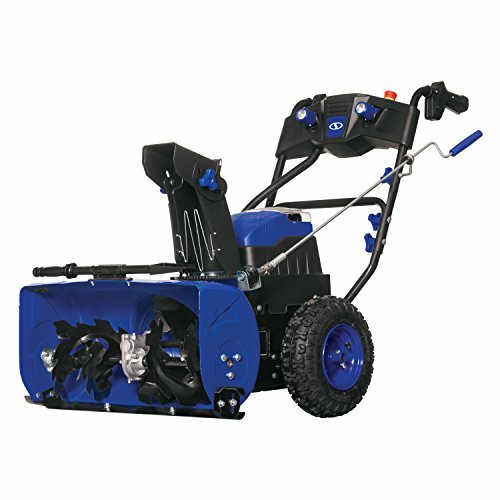 Determining which is the best two stage snow blower can be difficult simply because it often depends on your needs. For those with bigger driveways who expect to experience 1-2 feet of snow a smaller snowblower just won’t be able to hand it, even if it is a two-stage design. On the other hand, if you’re dealing with a large driveway but only get a few moderate inches rather than consistent sub-zero temperatures you’ll be wasting your money on a pro-grade machine. The best two stage snow blower is probably the Husqvarna ST230P is probably the best all-round option because it’s not super expensive but still has plenty of features and power. The heated handles are extremely nice and while it is very heavy it has all the features you would need plus a decent clearance height. The only real downside to this model is if you have grass or gravel it’s going to be too low. It has a good sized engine and can still throw over 30ft which is reasonable unless you’re dealing with a very big area. It has a really wide path (30”) and won’t require you to use batteries like the electric Snow Joe.